My area of research involves explicit and implicit memory with a particular focus on explicit recognition judgments; that is, the decision that someone or something was an element of an earlier personal experience. The nature and number of processes involved in recognition memory is currently under debate. 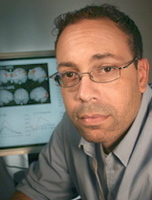 Using such methods as 1) statistical modeling of behavioral data, 2) examination of recognition in patients with focal brain damage and 3) functional magnetic resonance imaging (fMRI) of healthy participants during various recognition tasks, we are beginning understand the complex processes which allow us to situate current experiences into our own unique personal pasts. Dobbins, I.G., & Han, S (2006). Cue- versus probe-dependent prefrontal cortex activity during contextual remembering. Journal of Cognitive Neuroscience, 18, 1439-52. Schnyer, D.M., Dobbins, I.G., Nicholls, L., Davis, S., Verfaellie, M., & Schacter, D. L (in press). Item to decision mapping in rapid response learning. Memory & Cognition. Fleck, M.S., Daselaar, S.M., Dobbins, I.G., & Cabaza, R (2006). Role of prefrontal and anterior cingulate regions in decision-making processes shared by memory and non-memory tasks. Cerebral Cortex, 16, 1623-30. Schnyer, D. M., Dobbins, I. G., Nicholls, L., Schacter, D. L., & Verfaellie, M (2006). Rapid response learning in amnesia: Delineating associative learning components in repetition priming. Neuropsychologia, 44(1), 140-9.